Perk up grilled fish, chicken breasts or ground turkey burgers. Also nice for dipping tortilla chips or crackers. Vitamin A 15.5%, Vitamin C 42.7%, Calcium 4.7%, Iron 8.5%. Prepared using all ingredients listed. No salt added, low fat black beans, 1/4 teaspoon salt, 1/4 teaspoon pepper, and no salt added frozen corn. 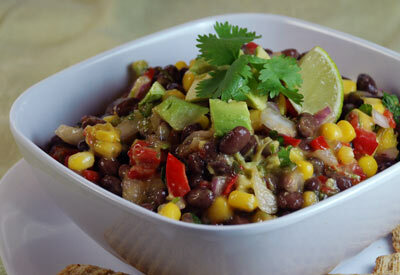 Combine black beans, cilantro, tomato, jalapeno, red onion and lime juice. Taste and add salt and pepper, as needed. If desired, add all or your choice of avocado, mango, corn kernels or red bell pepper. Garnish with a sprig of fresh cilantro and a lime wedge.